A blog dedicated to becoming your all-knowing, all-seeing movie friend. My sister’s birthday was this past Saturday. In an effort to “keep it classy” we decided to do a traditional English tea at the Fairmont Palliser Hotel followed by watching the re-imagining of a classic – Planet of the Apes. Growing up, I loved Planet of the Apes, but my love was nothing compared to my sister’s. She remembers things about the series that I forgot long ago. When Rise of the Planet of the Apes came out in 2011 starring James Franco and John Lithgow, we were convinced it would be a disaster of epic proportions – think Cutthroat Island and Waterworld. By the movie’s end, I was openly crying and my sister was misty-eyed. The plot was surprisingly well laid out and it actually made you think a little while being entertaining. Three years later, we sat in the theatre eagerly waiting to catch up with our favourite primates. Dawn of the Planet of the Apes has a different tone than its predecessor. In Rise, we see Caesar’s growth, struggles and his eventual fight for freedom. In Dawn, its 10 years after the Simian Flu has wiped out almost all of humanity. 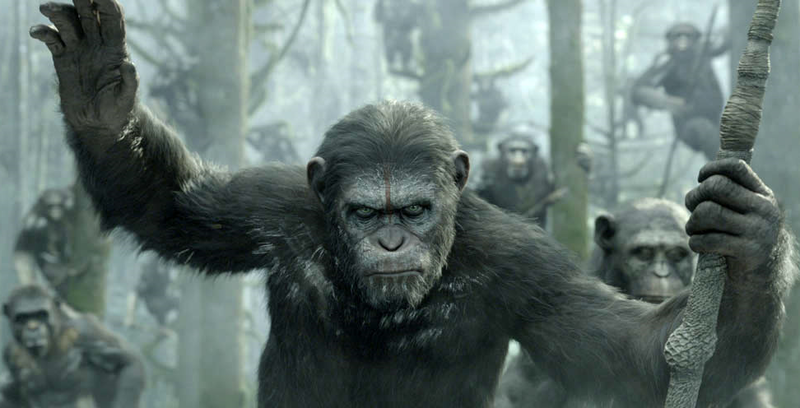 Caesar (Andy Serkis) has become a leader and established a community of apes. The apes believe humanity’s extinct until they come across a group of survivors in their forest. The humans want access to a dam on ape land that can provide electricity to their small city. Caesar is forced to make decisions that could result in war. The re-emergence of humans creates a divide between the apes. Caesar wants to help the humans and hopes that one day; they can all live together peacefully. His second in command, Koba (Toby Kebbell), was experimented on in a lab and wants nothing to do with the humans. On the human’s side, it’s almost a parallel storyline. Malcolm (Jason Clarke) and his girlfriend Ellie (Keri Russell) trust Caesar, while their leader Dreyfus (Gary Oldman) is more than willing to kill off the apes if they cause a problem. The theme that runs throughout the movie is how similar the apes have become to humans and that they’re capable of making the same mistakes in the future. Viewers have to decide whose side they’re on. The CGI is seamless. The battle sequence where the apes storm the human city is amazing and has a bit of everything – guns, horses, fires, explosions, tanks…you name it. The apes’ faces and bodies are highly detailed and you can tell the characters apart easily. Andy Serkis’ and Jason Clarke’s performances drive the movie. The patriarchs try to do what’s best for their communities’ despite their mutual respect and sympathy for one another. Serkis is at his finest. His movements and expressions give Caesar dimension while keeping everything subtle and subdued. Dawn of the Planet of the Apes needs a third installment since the Apes series is only getting better. Dedicated to experiencing all video games: good, bad, or downright ugly. A Straightforward Guide to Horror Movies.